Every golfer has a bucket list. Some keep a mental note of the courses they’d like to play or the tournaments they want to attend, while the truly devoted/dangerously obsessed print out their wish list, keep it safely stored in the Golf Room at home, and meticulously devise a schedule that may or may not include family members, but which will enable them to cross off each entry before they pass on to their golfing Eden in the sky. One of my must see/do/plays is to be part of a PerryGolf vacation. The company, founded by the Dalgleish brothers - Colin and Gordon - in Scotland in 1984, offers luxury golf tours to its 12 main destinations - Scotland, England, Wales, Ireland, France, Spain, Portugal, Italy, South Africa, Australia, New Zealand, and Canada – and the testimonials, assuming they’re genuine of course, generally suggest that those fortunate enough to be able to afford a PerryGolf tour would be foolish for doing it any other way. 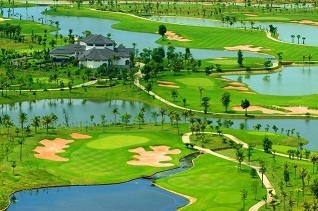 Recently added to the PerryGolf roster was a fully-escorted nine-night/six-round trip to Vietnam and Cambodia that not only includes golf on each country’s best courses (two designed by Nick Faldo, one by Colin Montgomerie, and one by Greg Norman) and accommodation in some rather opulent hotels/resorts, but also trips to some of the region’s most important cultural landmarks – the incredibly well-preserved 15th century trading port of Hoi An in southern Vietnam; Angkor Wat, a 12th century Hindu Temple in Cambodia; and Angkor Thom, the former capital city of the Khmer Empire. Golf, beach time, and evening meals at Hooters make for a fine golf trip. But there aren’t any UNESCO World Heritage sites along the Grand Strand, so after 20 straight Myrtle Beach vacations, your horizons might need broadening. PerryGolf’s ‘Golf, Temples, Tombs and the Secret of Cua Mang Tay’ Tour (February 12th - 21st 2014) might not be for everyone, but for those who have done everything else, it might just be the trip of a lifetime.